Professor em Barbara Ekbom is SITES steering groups new chairman. In the interview below she tells about her background as a researcher and the new assignment. As a new chairman in SITES steering group, what are your expectations for your assignment? 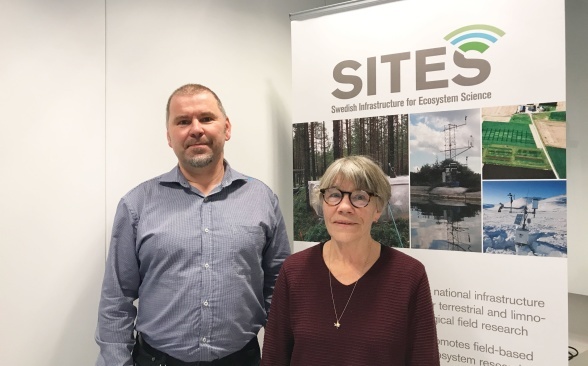 My expectations are that I will get to know those that run and work at the SITES field stations and together with the steering group we will all work towards raising SITES’s profile both internationally and nationally. Transparency in decision-making is important and I expect that the SITES steering group, the secretariat, station managers, and partners will have an open dialogue in order to maximize both the quality and quantity of the research performed at SITES field stations. I have a Bachelor’s degree from the University of California. In order to make ends meet during my years at the university I had to find a job. I got lucky and found a position as Lab/field assistant in a research group that worked with biological control of insect pests in agriculture. During the growing season we had many field experiments to take care of and in the winter we went through the material we had collected and analyzed data. I worked with professors, technicians, and PhD students. I found that I was fascinated by asking questions and then designing experiments to get answers. And the answers always led to new questions and I knew I wanted to continue with biological research, mainly field based. I never looked back. Which is your relation to terrestrial/limnological field based research? During my time as a scientist I have worked with questions concerning insect pests and biological diversity in agricultural and forest systems. It is absolutely necessary to be in the field if one wants to understand the complex interactions found in biological systems. We would very much like to be able to predict the future. Ecologists have learned that long data series with observations/measurements from the same locality are extremely valuable when trying to understand biological processes. Many research projects are of a short duration and to counteract the negative aspects of this research infrastructure is important. A short project can be performed in a place that has a “history”. Today, it is also important for scientists to participate within research infrastructures because it is impossible for one scientist to master all the techniques in measurements and database usage necessary to address the complex research questions we much ask. Two phrases can describe the value of field infrastructure: long term information and access to expert competence. In what way do you hope to contribute to SITES organization? I have been involved in leadership aspects of many different kinds of organizations and have learned a lot. Clear and systematic leadership plus open communication lines are almost always important for a well-functioning group. It is also important that decisions are effected as soon as possible so that the members of the organization have confidence in the leadership. I believe that I will be able to use my experience from other organizations for the benefit of SITES.